January 7th 2008: Acting CEO, Jenny Merkus, writes to Moreland Leader newspaper maintaining Council’s wrongful understanding of stage 3A water restrictions and their water Conservation plan requiring Coburg Olympic Pool to be closed to offset water use at other pools. January 10th 2008: FOCOP meet with Moreland City Council Acting CEO, Jenny Merkus to present a petition with 750 names on it. Council denies they misunderstood stage 3A guidelines and make an undertaking to seek clarification from water authority. A report will also be prepared to identify what is needed to reopen the Coburg Olympic Pool for the remainder of the 2008 summer season. Report to presented to Jan or Feb council meeting. FOCOP to be provided a copy of report before tabling at council meeting. January 17th 2008: John Fain on ABC radio interviews Moreland Mayor, Joe Caputo. Cr Caputo admits Council got it wrong resulting in the unnecessary closure of the Coburg Olympic Pool but will not commit to its reopening, claiming Council has not the funds. Cr Caputo says a report is being prepared to identify what is needed to get the pool open. This report will be used to make a decision on the immediate future of the pool at the next council meeting on January 30th 2008. Cr Caputo offers a shuttle bus service as an interim solution. January 30th 2008: FOCOP prepare for Council meeting without a copy of the Council report on the pool. A morning meeting with North East ward Councilors Andrea Sharam and Mark O’Brien allows us to hear some of the report findings and gauge Councilors position on the re-opening of the Pool. Both councilors state they would not support the pool re-opening for the 2008 summer or beyond. Both councilors claimed the pool is past it’s used by date, requiring too much money to fix. Councilors talked about the Moreland Aquatic strategy and the Coburg 2020 plan as a solution to the closure of the pool. December 1st 2006: Coburg Olympic Pool fails to open for the summer season as scheduled. Being a hot day, many people turned up to the pool for “the first day of the season swim” to find the pool closed. With Moreland Council failing to erect signage explaining the closure, or provide information on Council website and pool answering machine, many local residents are left guessing. December 12th 2006: Moreland Council announces the pool is closed due to maintenance issues until further notice. Council website and pool answering machine are not updated with new information. This is a verbal response provided to residents upon telephone enquires. Information on the exact nature of maintenance issues is not disclosed. December 28th 2006: Moreland Council media release states the pool will remain closed for the remainder of the summer 06/07. "Council regrets that the Coburg Olympic Pool in Murray Road will not re-open this summer so that Council can meet its water conservation obligations under the Stage 3 Water Restrictions. Whilst the recent Coburg Olympic Pool plant room repairs are complete, final testing and calibration cannot be finished until the pool is filled. This is not possible because we are unable to meet Yarra Valley Water saving targets across the municipality. It is a tough choice but not filling this pool means the others can stay open." Council still fail to erect signage explaining the pool closure, or update Council website and pool answering machine. Local residents are still guessing! Curiously, local residents look thru the fence to the murky waters a very full Coburg Olympic pool. January 3rd 2007: Media statement from Moreland Mayor, Councilor Mark O’Brien confirms the following "Moreland has reached the crossroads with our swimming pools. Whilst the drought and Level 3 water restrictions have caused us to close the Coburg Olympic pool, we cannot hide from the fact that the use by dates for most of our pools is fast approaching. Some of them leak a great deal of water, some have terminal rust and others are simply not adequate for their purpose." January 9th 2007: Moreland Council offer the following information in an article published by The Age newspaper “Water authorities told the council that opening the pool would breach its water conservation obligations under stage 3 water restrictions and that other pools in the area would have to close if it decided to keep the Coburg outdoor pool open”. Mayor, Cr Mark O’Brien is pictured standing at the end of the pool looking concerned – ironically; the pool is shown to be full of water, albeit murky and uninviting! September 20th 2007:Jenny Merkus, Director of Social Development at Moreland Council, responds to the FOCOP request with the following written statement "Council wish to confirm that as a result of the ongoing water restrictions, Council’s commitment to its water conservation plan and the subsequent water saving initiatives, it is not feasible to open the Coburg Outdoor pool for the 2007/2008 season unless current water restrictions are eased or alternative water savings initiatives of comparable volumes can be identified at other aquatic venues." September 9th 2007: Moreland Mayor and North East Ward Councilor, Mark O’Brien, offers the following written response to the FOCOP request, "the council spent $80,000 on the pump repairs last year in time for the season. The only reason it stayed closed was the refusal of Yarra Valley Water to allow us to re-fill the pool due to the water Restrictions." September 10th 2007: North East Ward Councilor, Andrea Sharam offers the following written response "Last year the pool had a major plant problem and then the state govt imposed harsher water restrictions which meant that the pool could not be re-filled once the works were completed. 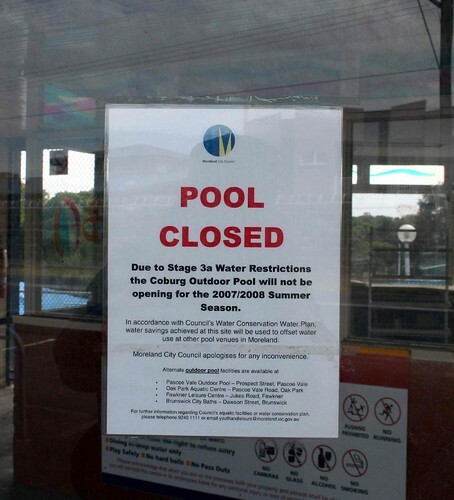 It is also true that it is unlikely to re-open this summer because of the water restrictions"
December 22nd 2007: FOCOP confirm with local water authority, Yarra Valley Water, that Coburg Olympic Pool is allowed to open under current stage 3A water restrictions. December 31st 2007: Moreland Leader Newspaper breaks story of the Pool’s unnecessary closure by Moreland Council. Yarra Valley Water spokesperson, Emma Hiller, confirmed that public pools were not included in the water conservations plans required of councils, and it was a council decision to close the Coburg Olympic Pool. On January 30th 2008, more than 30 Friends of Coburg Olympic Pool (FOCOP) attended the Moreland council meeting at Bell St, Coburg. Question time was extended to hear many questions from the public gallery. Councillors disputed claims that the Coburg Olympic Pool has been closed intentionally, claiming the closure is temporary. Earlier that morning, FOCOP prepared for the Council meeting without a copy of the Council report on the pool. A morning meeting with North East ward Councillors, Andrea Sharam and Mark O’Brien, allowed us to hear some of the report findings and gauge Councillors position on the re-opening of the Pool. Both councillors stated they would not support the pool re-opening for the 2008 summer or beyond. Both councillors claimed the pool is past its use by date, and that the majority of councillors would not support spending 350K required to re-open the pool. Councillors talked about the Moreland Aquatic Strategy and the Coburg 2020 plan as a solution to the closure of the pool. However, later that night, at the council meeting, Moreland council agreed to consider the funding of the works required to re-open the Coburg Olympic Pool as part of the 2008/2009 capital works budget. This would take place in June/July and would require councillors to vote either way. All the councillors at the meeting gave the impression they have no intention of closing the pool - which begs the question why then the pool is still closed? And why has the Moreland Council not committed to opening it next summer?